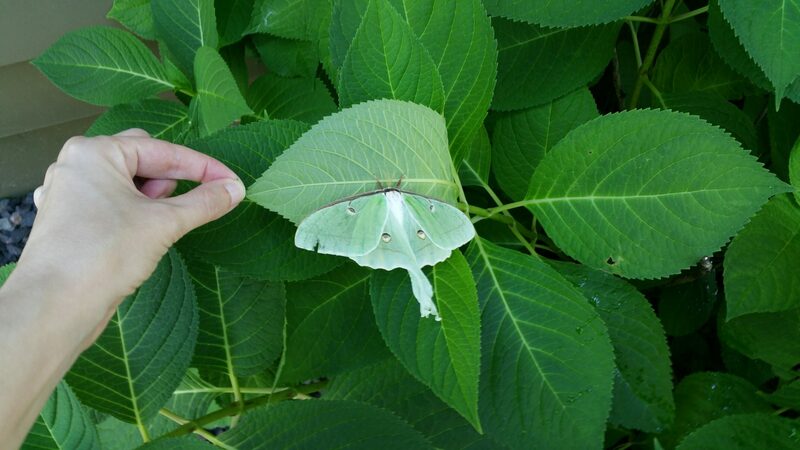 We have a Luna Moth laying eggs on one of our plants. These organisms are not “rare” in the conventional sense, but they are only adults for 7 days, and in this region, the adults are only active for 1 week in February, then another generation is active for one week in May, and the last generation of the year is active in August, so it is rare to capture an adult in this stage. They are nocturnal, so during the day, if you find them, they simply latch, stock still, to the underside of leaves. We were able to pull the leaf upside down and get this incredible shot. It is right in our front yard, and so very beautiful. They emerge from their cocoons without mouths. They mate, lay eggs, then starve, limiting their lives to one week as adults. I suspect it will wake up at night and find another place to rest in the morning. I’m really happy my wife is diligent about her plant watering, otherwise we would have missed this.